Slice tomatoes and grate Gruyère cheese. Roll out pizza dough and an even number of equal-sized circles using the cookie cutter. Preheat waffle iron and grease with some oil. 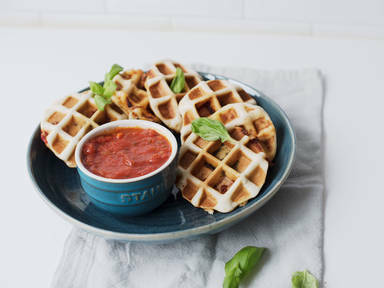 Add a circle of dough to the warm waffle iron, spread some tomato sauce on and top with sliced tomatoes, grated Gruyère cheese, fresh basil leaves, and pesto. Cover with another circle of dough, then close the waffle iron and cook for approx. 3 – 4 min. or until they are golden brown. Repeat with remaining dough and ingredients until everything is used up. Serve warm with tomato sauce as a dip. Enjoy!